After all the hype, a date and the venue have been announced for the premiere of the much awaited movie, Unforgivable. 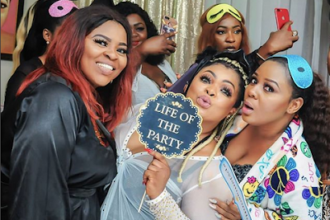 Lead act and the producer of the movie, Dayo Amusa made the announcement at Silverbird, Ikeja City Mall during the press screening of the movie. The premiere will take place at the same venue, Ikeja City Mall on 27th October, 2013, while the movie will be available at the cinemas nationwide from Friday, November 3rd, 2013. Mike Ezuruonye and Desmond Elliot gave award winning performances and turned heads with their expression in Yoruba language. The movie which was directed by Desmond Elliot has stars like Dayo Amusa, Mike Ezuruonye, Bukky Wright, Desmond Elliot, Fathia Balogun, Bidemi Kosoko, Bimbo Thomas, Iyabo Ojo, Niyi Johnson, Lawal Aisha, Titilayo Shobo amongst others, while it introduces new acts like Ibironke Ashaolu and Wale Alabi. 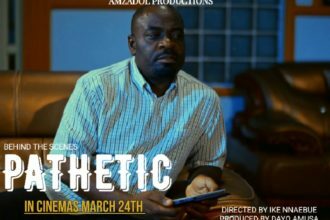 The suspense, intrigue, informative and educative film centers on Damola (Mike Ezuruonye) who is blinded by his pride to see and accepts the undiluted love by his wife, Sewa (Dayo Amusa), who sacrifices everything to make her home work to the detriment of her health with the hope of changing the bad boy to a good one. She was so engrossed with marital issues that she neglected her own health which led to cancer. On the other side of the wall is a well cultured Richard (Desmond Elliot), who doesn’t have the courage to express his feelings and affection to Sewa (Dayo Amusa) whom he loves way back in the university. Unforgivable is a movie that evoked emotion, pity, love and regret. Very few media practitioners left the hall without shedding tears. So, how did Unforgivable come about? Who stepped on the other’s toe that made it difficult to forgive? Unforgivable will provide answers and many more when it finally hits the cinemas in November.